Are you not able to leave the house without a bag full of snacks? How many snacks do you and/or your kids have during the day? Are those snacks nutrient dense or nutrient poor? Are those snacks even necessary? I'm guilty of snacking and pushing snacks on my daughter when she was cranky and I thought it was because she was hungry. Then I realized I'm really doing my family a disservice. I'm teaching my daughter to eat ALL THE TIME and that it's not ok to be hungry. I also am guilty of previously bribing my kid with snack foods. It makes me sad to think about those times, because I see that I was teaching my daughter to have an unhealthy relationship with food. I grew up thinking food is a reward sometimes. I would think 'Oh look...I ate a salad, now I can have dessert' when it was a small side salad made of only iceberg lettuce, a few shreds of carrot, croutons, drenched in ranch dressing to go with my pasta. I was able to rationalize that salad for a super huge, sugary dessert....everyday! It's really no wonder I was lethargic and suffered from migraines and depression. Then I realized that food isn't a reward, it's necessary for living. I used to snack all the time myself also because of all my high carb and high sugar eating. I would crash, become hypoglycemic and reach for something else sugary to quickly pick my blood sugar back up just to crash later...you get the picture. Since starting to live my healthy lifestyle, I've learned that snacking isn't even necessary. I want my list of healthy snacks! Thank you! Be sure to confirm your subscription. You'll then immediately get your download! Every kid place I go with my daughter (ie gymnastics, playgrounds, field trips), I observe parents who bring a lunch bag FULL of snacks! Goldfish, graham crackers, yogurt (or even worse Gogurt - what the heck is that anyway?! ), fruit pouches, string cheese, candy and on and on. Most snack foods aren't even food! Goldfish has "enriched" flour which means that the flour was ultra processed and stripped of anything beneficial and then they added synthetic 'nutrients' back into it. A popular brand of graham crackers has the enriched flour, it also has soybean oil and hydrogenated oil (read about the dangers of hydrogenated and soybean oil here). They also have artificial flavor and cornstarch - a load of chemicals that are genetically modified! For one sheet of those graham crackers, it's 23 net carbs and 8 g of sugar!!! Remember the recommended daily amount of sugar for kids is 11g, and remember that carbs turn into sugar. Yogurt typically has a ton of sugar and artificial flavor, the fruit pouches have way too much fruit which means way too much sugar, and string cheese is typically from conventionally raised cows. In my blog post about the food & mood connection, I discuss how certain foods like gluten and sugar lead to mental illness. What do most typical snack foods contain? Gluten and sugar! I hope I didn't overwhelm you with all that. I do hope I made your jaw drop and motivated you to go throw away these items (or anything like them) should you have some in your pantry right now. I also don't intend to make anyone feel like they've failed as a parent, in any way! My goal is to bring you information that will empower you to take control of your health and your family's health! It starts with nutrition! As I've said before, about 95% of disease as we know it today is created by what we do to ourselves. This includes chronic diseases, mental health illness, cancer, etc. So let's stop making ourselves sick! And our kids are counting on us to make the best possible decisions for them too! It might be hard to reduce snacks at first, but kids are resilient! They bounce back so fast; adults on the other hand, will take longer to adjust to the sugary/carby snacks no longer being available. If you feel like you or your child 'need' a snack, that means something is missing from the 3 main meals a day. There is an exception for babies/infants as they have very small stomachs and may just be breastfed. But for the rest of us, our 3 main meals a day should have enough nutrients (vitamin, mineral, fiber, fat and protein) to get us to the next meal. 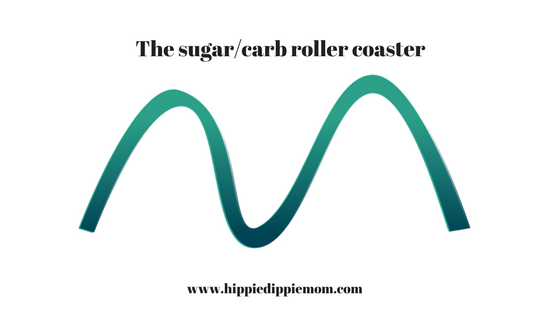 Too often our meals consist of a high amount of sugar and/or carbs which causes us to crash and leaves us with that feeling of 'I must have food NOW'. Our hunger and moods look something like the image above when we're eating a nutrient poor diet. Our 3 main meals should consist of good fats like coconut oil. avocado, or cheese/butter/ghee from grass fed cows. Good fats are necessary for good health and they help us stay satiated (so we don't feel hungry 1-2 hours after a meal). Protein from pasture raised, grass fed animals is also a must. Half of our plate at every meal should be covered in veggies, a small portion of fruit isn't a problem. Keep in mind, one serving of fruit is equal to 1/2 of a green apple or a handful of berries and we should only be consuming about 2 servings of fruit per day. The sky is the limit for vegetables. The only beverage we need is water. Also, ask yourself if food is really what's needed at that moment. Are the kids cranky because they haven't had enough water to drink or need a nap? Are the kids really the ones who want a snack, or is it you? Do they need some positive attention like a hug? These should cover half of our plate at every meal! They also make excellent snacks! All that being said, I do feel like there are times when snacks should be available. If your child is super active, they'll need more food as fuel. You can use snack time to deliver nutrients to your body too. My top 3 picks for easy snacks are: (1) cut veggies. We always have cut up veggies ready to eat in our fridge! Cut up carrots (or buy baby carrots), celery, cucumber, jicama, etc. You can even use almond butter or hummus to dip the veggies in as these are good fats and/or protein. (2) RawRev bars - they're made with raw all natural ingredients, are super low in sugar and are yummy!! My daughter's favorite flavor of the RawRev bar is the Peanut Butter, Dark Chocolate and Sea Salt; mine is the Chocolate Chip Cookie Dough. (3) Plaintain chips - sweet, salty, garlic, spicy - flavors to please anyone. These can be used in place of crackers and chips. I'm ready to eat healthy snacks! Thank you! Be sure to confirm your subscription! Then you'll immediately receive your download! As a busy mom, I know how stressful it can be to make sure that nutrient dense meals are on the table. That's why I meal plan! Read more about meal planning here and then let RealPlans plan all of your healthy meal plans for you! Yup they'll plan breakfast, lunch and dinner for the nutritious diet that's right for your family complete with recipes and shopping list! Set a goal to notice how many snacks are being consumed daily and to reduce that number. Feel free to follow me on social media for more healthy eating tips. PS This post contains affiliate links. The food & mood connection: How to quickly and easily improve both!